Miriam: What's the use? You'll never stop gambling. Blah blah blah Marilyn Monroe! Yadda yadda Marilyn! Blah di Marilyn Monroe! Do you want to give me some money now? Fox thinks that you do, which is why this movie is on DVD at all, and why Marilyn's face is on the front of the case, twice. But she gets almost no screen time�there's maybe ten minutes of Monroe, and having her listed as the fourth lead means that she's been leapfrogged over probably a dozen actors. She's a stunning piece of arm candy, all right, as a recently crowned Miss Cucamonga, doing a little gold digging; but she's just a prop, really, in this minor, shopworn, modestly entertaining little movie. 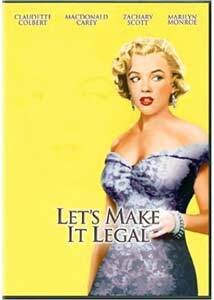 Let's Make It Legal is the kind of C picture that doesn't get a theatrical release anymore; our contemporary is probably a made-for-cable movie on Wifetime, television for women. It runs just over an hour and fifteen minutes, which means only that you won't ever find yourself ninety minutes ahead of the plot. Anyway, here's what happens: after better than twenty years of marriage, Hugh (Macdonald Carey) has unceremoniously been given the boot by his wife Miriam (Claudette Colbert). Her only co-respondent is the fifth at Santa Anita; his vice isn't other women, it's gambling. Complicating matters: Hugh and Miriam's daughter, Barbara (Barbara Bates), has moved back in with Mom, along with her husband, Jerry (Robert Wagner), and their new baby. Inconveniently enough, Jerry works in P.R. for Hugh; so he spends his days with one of his in-laws, his evening with the other. And along comes Victor Macfarland (Zachary Scott), a hometown boy made good; he jilted Miriam years ago for reasons she still doesn't understand, went off to make his fortune, and is now back to get some good publicity, for his nomination for a vaguely described ambassadorship is about to come to the Senate floor. Will Victor and Miriam rekindle their old flame? Will Hugh be able to lay off the craps table and woo back his one true love? Will Jerry succeed in getting his mother-in-law married off, and moving his own family into their own home? It's not gripping stuff, but it passes the time. Colbert is always lovely, and it's nice to see an actress be candid about her age; she takes pride in being a grandmother, and these days especially, you'd never see the leading role in a romantic comedy go to a woman who wouldn't be asked for some I.D. while buying beer. Everybody else is a little wooden, though, including Monroe (who isn't given much to do) and Wagner; particularly in need of some Stanislavski triage is Barbara Bates. Sharing screenplay credit is I.A.L. Diamond, who shortly thereafter would become Billy Wilder's writing partner; he's responsible in part for what may be Monroe's best performance, in Some Like It Hot. But judging from Let's Make It Legal, you'd never glean they'd go on to do great things together, as this is middle-of-the-road, lukewarm stuff. Image Transfer Review: This is a pretty shoddy transfer, full of dirt and big ugly reel change indicators. There are resolution problems, as well; the costume department seemed to favor polka-dot ties for the gentlemen, and they shine and glare on this disc. Audio Transfer Review: Either the original mono or newly minted stereo track will be more than serviceable, as it all sounds clear, though with a certain amount of hiss. Extras Review: Other than a bushel of Monroe trailers, the only extra here is a commentary track from co-star Robert Wagner. He doesn't have much to contribute about this film particularly, so instead this becomes his rambling monologue on growing up in Hollywood: "My college was 20th Century Fox." He discusses his rise, from the Bel Air Country Club to extra to a contract player making $125 a week, to heartthrob, to Hart to Hart; it's a story about another time in Hollywood, and it has its charms. Oddly enough, Wagner's best moments aren't discussing Monroe or this movie, but are when he's chatting about his idol, Daryl Zanuck; or acting in the West End with Laurence Olivier in Cat on a Hot Tin Roof; or getting beat up on the Universal backlot by John Ford. In many respects, this track is the most memorable thing on the disc. Calling this a Marilyn Monroe movie is like calling The Graduate a Richard Dreyfuss movie. (Should I get the cops? I'll get the cops.) Though Monroe's cameo may be the most salient marketing aspect here, it's really a throwaway bit of business, and mildly entertaining, at the very best.